For the last set of reviews for macro month we are going to look at two beers that once dominated the American beer scene. Both were the most popular beer in the country at one time and both have fallen whether through mismanagement, greed, or a combination of both. Pabst Brewing is a beer conundrum. It is the fourth largest brewer in the country but it doesn't own a brewery, while it was started in Wisconsin it now has its corporate headquarters in sunny Los Angeles. It was a beer my grandfather and uncles drank but it is reinventing itself as a go to beer for the hipster and alternative crowd. While Pabst has been resurgent it is a pale imitation of its halcyon days. In the latter half of the 1800s Pabst was the dominant brewery in the United States and locked into a fierce rivalry with Anheuser-Busch. The whole blue ribbon thing was Pabst's way of rubbing their rival's nose in it. Unfortunately Prohibition was not kind to Pabst and compounded with some poor decisions by the 1940s they were well outclassed by both Schlitz and Anheuser-Busch. Eventually they lost their reputation too, ending up in the bargain bin of cheap beer. 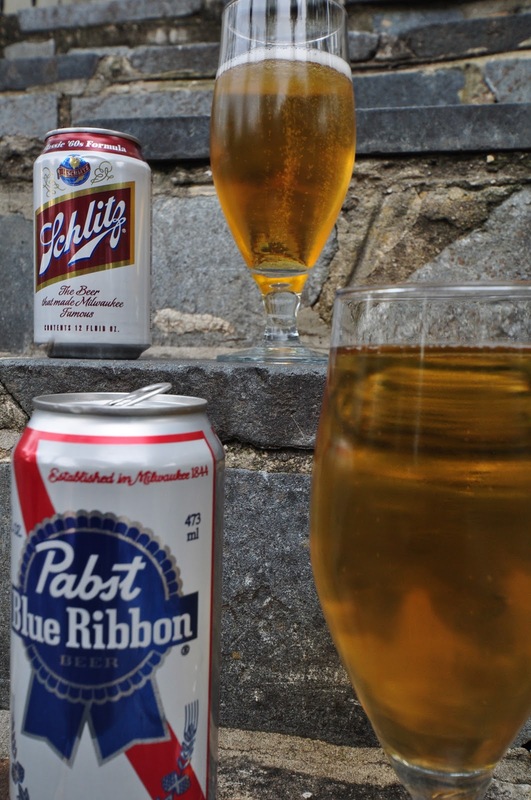 A funny thing happened though in the middle of the last decade, Pabst became popular again. A new group of people started to glom onto the beer drinking it as an ironic statement first, but later as an alternative to Budweiser, Miller, and Coors. In addition, Pabst Brewing actively worked at corralling a lot of old and defunct American lager brands, plumbing the nostalgic value out of these where they could. Pabst Blue Ribbon poured a clear yellow straw color with a white foamy head. It has more flavor than its peers, at best it could be described as a very mild pilsner, with a hint of the earthiness and crispness you would find in one of those. It has a good deal of carbonation keeping it light on the tongue and it finishes with no real aftertaste except that faint macro flatness. Pabst isn't anything special but it is probably cheaper than its macro brethren and better you expect. It comes in at 4.74% ABV. In its heyday Schlitz Brewing went toe to toe and round for round with with the St. Louis heavyweight and often came out on top as the bestselling beer in America. The 1940s and 1950s were golden times for Schlitz and it flip flopped back and forth for the top spot. Eventually though Budweiser won out seized the top spot for good. To make a long story short Schlitz decided to become more efficient with the breweries they had and started shortchanging their fermentation process and the ingredients for their beer without an overarching long term strategy. Needless to say it spelled disaster and Schlitz tanked, dragging its reputation down with it. By the time it was all over Schlitz ceased to be, bought up by Strohs, who was then acquired by Pabst . Now Schlitz is just another beer brand in its old rival's retirement home of brews. So what to make of the beer itself. For starters this took a little bit of work to track down. I was set to go to Pennsylvania to find it, but fortunately friend of the site, Eric, tipped me off to a store in Rockville, Maryland that was a whole lot closer. I made the much shorter drive to Rockville and discovered Belby's Discount Beer & Wine. A quick side note, Belby's is the kind of beer, wine, and liquor store that is fun to stop by and see what treasures are hidden on the shelves. Family owned and operated it is packed to the gills with alcohol goodness both with top shelf and low shelf. While its non-descript appearance doesn't look like much on the outside don't let that fool you. They have a good selection, are very friendly, and are reasonably priced. There were more than a few beers on the shelf that I hadn't seen in awhile or ever before and that makes this store a winner in my book. Now lets get to the pouring. Schlitz poured out a clear light golden color with a white foamy head. On the drink the first noticeable thing is that there is some body to this beer. It has a very mild hop to it with good carbonation mixed in with some biscuity flavor, and it finishes with a pleasant malty aftertaste. It is an easy drinking beer. It is reminiscent of Coors Batch 19, another beer that surprised me. It comes in at a 4.6%ABV. What makes the 1960s recipe so intriguing is it aids in revealing Schlitz's twofold legacy. First is the lesson on what not to do with your brand. That is the overt part. The second though, is a little more devious. Don't think for a moment that Schlitz's competitors didn't see what happened and learn from Schlitz's mistakes. I would argue that Anheuser-Busch, Pabst, Miller, and Coors all incorporated some of the efficiencies that Schlitz had used both with beer ingredients and fermentation process but were better prepared to take full advantage of them. In other words the macrobrews you drink today are pale reflections of what they were fifty years ago. To wrap this up if you are going to drink a macro brew then you could do a whole lot worse than drinking a Schlitz.